COAS General Qamar Jawed Bajwa made a high profile three-day visit to Beijing, where he was afforded the opportunity to call on Chinese President Xi Jinping. This level of a protocol is normally not provided to visiting heads of militaries but an exception was made in the case of General Bajwa. The Pakistani Army Chief also held meetings with his Chinese counterpart, officials of the China Pakistan Economic Corridor (CPEC) and other senior dignitaries, with whom he held discussions on bilateral security cooperation. According to the Chinese media, in all the meetings, both sides resolved to strengthen the relations between, Pakistan and China and continue the progress of the CPEC. China appreciated the security initiatives taken by the Pakistan Army for the ongoing CPEC projects and expressed the desire to benefit from Pakistan’s military experience. General Bajwa also visited the Headquarters of Peoples Liberation Army (PLA) in Beijing and met the PLA Chief General Han Weiguoa. The PLA chief appreciated and acknowledged high professional standing of Pakistan Army displayed while combating terrorism. Vice Chairman of Chinese Central Military Commission (CMC), General Zhang Youxia, expressed in a meeting that the “Pakistan Army is the backbone of the Pak-China relationship”. The visit by the Pakistani COAS was at the heels of Chinese State Councilor and Foreign Minister Wang Yi’s three-day official visit to Pakistan. After meeting his Pakistani counterpart Shah Mahmood Qureshi and making a courtesy call on President Arif Alvi and Prime Minister Imran Khan, the Chinese Foreign Minister opined that Pakistan-China relationship is based on a convergence of views and mutual respect. During his call on General Bajwa at the GHQ, appreciating the professionalism of Pakistan Army, the foreign minister said that the world should acknowledge Pakistan’s efforts towards regional peace and stability. The Army Chief’s visit to China had been planned well in advance but some politicians from the opposition benches found it prudent to surmise that all was not well with the Chinese State Councilor and Foreign Minister Wang Yi’s visit to Islamabad. Some Pakistani politicians misconstrued that Pakistan is considering reviewing CPEC projects, much to the chagrin of China; hence the Army Chief was hurriedly dispatched to Beijing for damage control. A leader of the opposition, who has enjoyed the largesse of the Chinese government for decades, now found it opportune to point out that the top Chinese official was received by a senior Foreign Office official at the Noor Khan Airbase at Chaklala, instead of a senior government functionary, who should have welcomed him at the airport instead. The learned opposition leader even went to the extent of sharing a picture of June 2017, when then Punjab Chief Minister Shahbaz Sharif had received the Chinese Foreign Minister. “But, today, on arrival at Islamabad, he got ‘Pompeo treatment’, when junior Foreign Office official received him! Protocol oversight or deliberate downgrading?” he inquired. Such baseless and irresponsible statements provided fodder to the grist mills of the detractors of CPEC, Pak-China deep ties and enemies of both China and Pakistan. Quoting the Pakistani opposition leaders, Indian media in particular and a section of the US media propagated that all was not well between the new government of Imran Khan and Beijing. Nothing could be further from the truth. The Prime Minister has instituted a CPEC body to ensure that the projects get completed on time. Indeed if corruption has occurred in the execution of any of the projects, the culprits will face the music. Sino-Pak ties are not between two governments but between two nations. Governments may come and go but the deep bonds between the “iron-brothers” are forever. Prime Minister Imran Khan will be undertaking a state visit to China this month. Yang Yi’s visit to Islamabad, Bajwa and now the PM’s high-level visits to Beijing should put to rest all rumors and misreporting initiated by the adversaries and antagonists of Sino-Pak ties. Such elements, both at home and abroad, who are trying to create a wedge between Pakistan and China over CPEC, are actually in a state of shock. India’s animosity is understandable because it has been trying to isolate Pakistan and has been a major critic of CPEC. Prime Minister Imran Khan’s high profile visit to Saudi Arabia and the Saudi leadership’s agreement to install the world’s third largest oil refinery in Gwadar city so Central Asian countries can be supplied oil, has shaken India out of its wits. As a first step, Indian External Affairs Minister Sushma Swaraj cancelled her meeting with her Pakistani counterpart Shah Mahmood Qureshi at the sidelines of UNGA quoting flimsy excuses. Moreover, her venomous presentation at the UNGA accusing Pakistan of the oft-parroted lines of supporting terror received flak at home. It is Pakistani politicians, who should realize that Sino-Pak ties along with CPEC should unite the nation, not divide them. Published in Daily Times, October 6th 2018. Protect homeland way of life; promote American prosperity; persevere peace through strength; advance American influence in the world; build India as a counterweight to China. Thus Trump has wrecked the possibility of establishing the states of Palestine and Israel, bringing the whole of Middle East to a state of crisis and catastrophe. This would result in decimation and destruction of more Muslim countries like Crusade one, which began in 2001. This is now Crusade Two, “to advance American influence in the world through strength.” Therefore chances of peace in Palestine now are remote, because the Arab World has its interests diverted towards war in Syria, Iraq and Daēsh and is engaged in managing the ravages of Arab Spring, while America, who could negotiate peace, has taken sides with Israel. China. 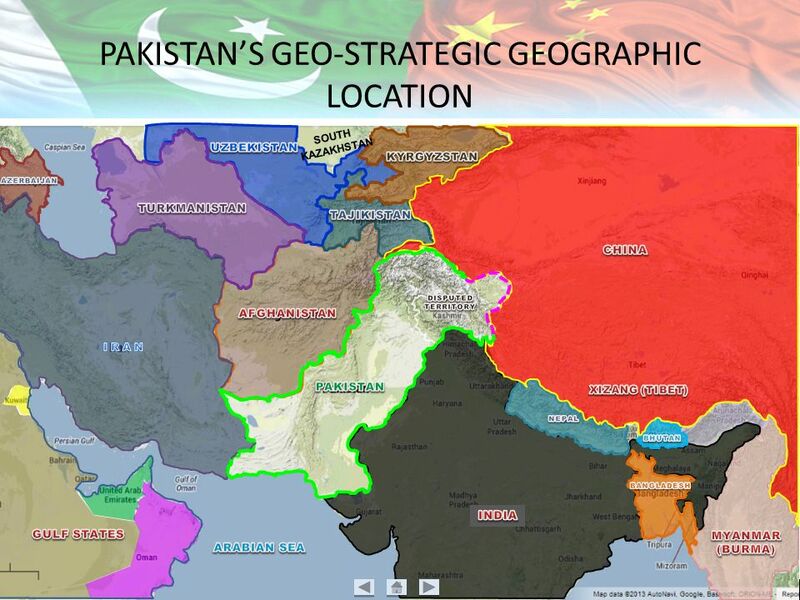 Trump has called China “the strategic competitor.” Instead of joining hands with China and follow their geo-economic strategy of peace through regional cooperation, he is trying to build-up the Indian counter-weight, against the rising military and economic power of China. The Indian Counter-weight, which could not contain and curb Pakistan from rising, now has been assigned the task to contain China, with “the United States locked and loaded”, in support of India. A withering superpower could do no better than this. North Korea. With limited nuclear weapon delivery capability, North Korea has been able to deter America, despite possessing a stockpile of nuclear weapons, most efficient delivery system and a state of the art air defence capability. Yet America has failed to develop a strategy that could build up pressure on North Korea and is showing a kind of helplessness, expecting China to bring sanity to the North Korean leader. The state of helplessness in case of North Korea, as well as Afghanistan, exposes the hollowness of super-power America, trying to advance their influence in the world, through farce policy initiatives. Pakistan lies at the centre stage of the regional conflict syndrome. It has to tread carefully protecting its interests, through the support of the people, embodied in the elected parliament, and building blocks of regional support of Iran-Afghanistan-Pakistan, under the security partnership of China and Russia. Pakistani nation shares with Iran, the will to resist and reject, pressures and threats and continues to rise with the sublime dignity of the great civilizations with whom it shares common borders. Pakistan is the Heart of Asia, as late Liaquat Ali Khan reminded the nation and we have to prove to be true to this great heritage. The Emergency Session of the OIC did not show any seriousness amongst the members of the states. Only a few heads of the State attended. There has been an erosion of unity amongst them, and the Arab world, in particular, has been in a state of disarray after the Arab Spring. Taking advantage of the regional anarchy, America and Israel have struck, which seriously “prejudices the civil and religious rights of the Muslims and other communities of Palestine”. The situation poses a big challenge to the entire Muslim World. Except for Turkey and Iran, none seem to be taking the matter seriously. The UN General Assembly has overwhelmingly voted against Trump’s Palestine Policy, and hopefully, it would put a check to Israel’s ambition of expanding at the cost of Arab territories for Greater Israel! Edhi (Sahib), who founded the world’s largest volunteer ambulance network, would have been 89 on Tuesday. Abdul Sattar Edhi founded the world’s largest volunteer ambulance network in Pakistan, the Edhi Foundation. 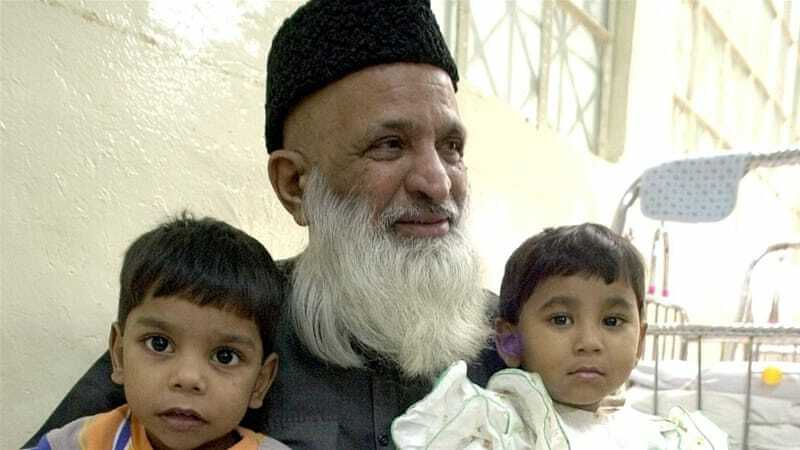 Unlike wealthy individuals that fund charities in their names, Edhi dedicated his life to the poor from the age of 20, when he himself was penniless in Karachi. The reach of Edhi’s foundation grew internationally, and in 2005 the organisation raised $100,000 in aid relief for the victims of Hurricane Katrina. Edhi was born before partition in Bantva, Gujarat, India on February 28, 1928. He died last year in Karachi of renal failure. He was offered treatment abroad but insisted on being treated in a government hospital at home. The Edhi Foundation’s slogan is: “Live and help live”. Today would have been his 89th birthday. 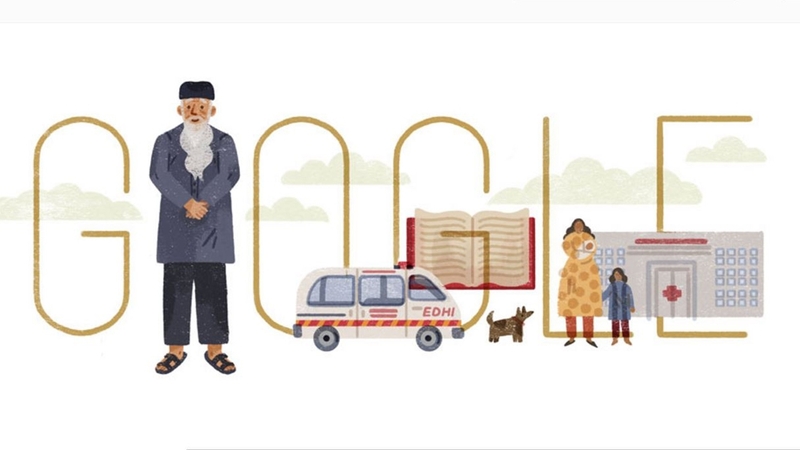 In his honour, Google changed its logo in the United States; Iceland; Portugal; Australia; New Zealand; Japan; Estonia; the UK; Denmark; Ireland and Pakistan to a doodle, or illustration, of Edhi. Google hailed Edhi’s “super-efficient” ambulance service. “In celebration of Abdul Sattar Edhi, let’s all lend a hand to someone in need today,” it said. The technology giant’s team has created more than 2,000 doodles for homepages around the world. Among those recently celebrated are Pramoedya Ananta Toer, Fred Korematsu and Edmonia Lewis. “The doodle selection process aims to celebrate interesting events and anniversaries that reflect Google’s personality and love for innovation,” the company says. With more than 1,800 ambulances stationed across Pakistan, the Edhi Foundation is Pakistan’s largest welfare organisation. In 1997, the foundation entered the GuinnessWorld Records as the “largest volunteer ambulance organisation”. If you call 115 in the South Asian nation, the Edhi Foundation will answer. 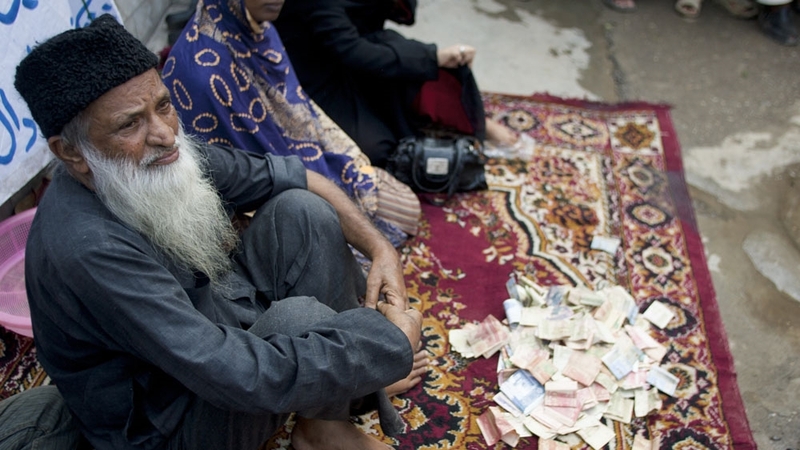 In his words, at the start of his work, Edhi “begged for donations” and “people gave”. This allowed him to convert a tiny room into a medical dispensary. He also bought an ambulance that he himself drove around. Raising more donations and enlisting medical students as volunteers, his humanitarian reach expanded across the country. Today the Edhi Foundation runs outpatient hospitals, a child adoption centre and rescue boats. It also helps in the burials of unidentified bodies. There are cradles for “unwanted babies” outside Edhi emergency centres. Throughout his life, Edhi emphasised the humanitarian, rather than religious, motivation for his work. His foundation receives “zakat” (Islamic charity) donations, which he used to help Muslims, Christians, and Hindus. After the nominations in 2014, the hashtag #NobelPrizeforEdhi was created; many said he should have been recognised instead of Malala Yousafzai, who is also from Pakistan. In that same interview, he recalled an incident that he would never forget. According to Pakistan’s Nation newspaper, the State Bank of Pakistan will next month issue a commemorative coin of Rs50 in memory of Edhi.